Years ago we had some wonderful wines from this estate in Tuscany. 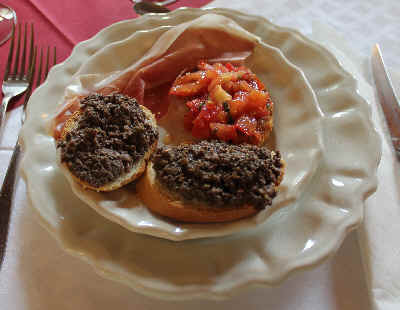 They're located a few kilometers from Certaldo and about 20 minutes' drive from San Gimignano. The wines were especially good and well-priced. The estate is owned by an American fellow who loves Tuscany and has this place as a "summer getaway." They've been out of the market for a number of years, having been overly aggressive in expecting importers to sell more wine than is actually possible. I think most Italian wineries look at the California market and think they ought to be selling boat-loads of wine here. But with so few wine shops specializing in good Italian wines and fewer restaurants willing to educate consumers (most just want wine with the label "Chianti" or "Pinot Grigio" and they are not fussy about wine quality, only "low price"), the California market is rather limited. 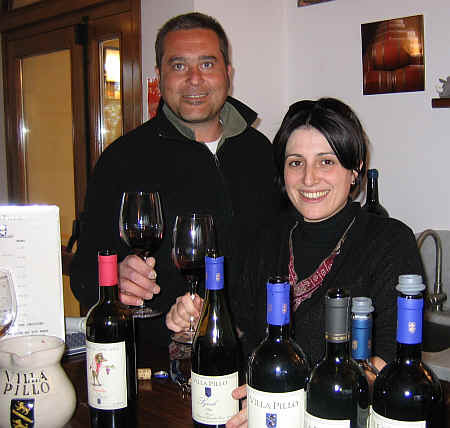 In the Spring of 2008 I dragged a local importer, an Italian gentleman, to taste the wines from Villa Pillo. I had tasted the wines and inquired about their interest in re-establishing ties to the California market. Signor Importatore was stunned by the good quality of the wines and the sensible pricing. Even with the dollar being weak, these wines are outstanding values. 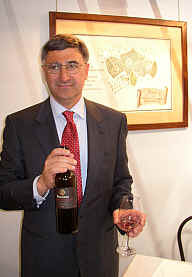 He's been importing their wines ever since and is delighted to have such good values in his portfolio. The estate has about 22 hectares of olives and 42 hectares of vineyards. That's a lot of wine and in recent years they've actually sold grapes. It seems they make more wine than they can sell. And they can't drink it all themselves, either. Sangiovese does well here. So does Merlot and Syrah. Their flagship wine carries the name of a nearby locality, Borgoforte. This is a medium-full bodied red wine. Sangiovese is blended with Cabernet and Merlot. Some wineries in the area call this sort of wine a "Super Tuscan" and they expect consumers to take out a second mortgage to buy a dozen bottles. Villa Pillo's current release comes from the 2014 vintage and it will set you back all of $11.99 (less if you're buying a case). While many Super Tuscans are so "internationally-styled" that you can't really 'taste' if the wine is from California, Argentina, France or Tuscany, this wine has a Tuscan soul. It's made to drink in the near term, so try a bottle and see how it strikes your palate. Seeing all those new French oak barrels, you might expect the wines from Villa Pillo to taste oaky. Happily, they do not. Winemaker Marco Chellini and estate manager Pamela Trassinelli use wood to mature and 'season' the wines, but you won't be picking splinters out of your palate. Also impressive here are Syrah and Merlot wines. Tuscany actually has a rather long history with Syrah and Merlot has made some impressive wines for a decade, or so. Villa Pillo's Merlot comes from a trio of vineyard sites which have clay soils, ideal for this variety. Their 2009 vintage is dark in color and shows a wonderfully plummy, dark fruit note. Despite all those oak barrels in the photo, wood is in the background here. I poured this wine recently for a Napa winery rep whose wine costs $40 and while she didn't commit suicide, she was impressed by the quality (and the price) of this Merlot. Syrah is a deep, dark red. I've tasted numerous vintages over the years. Sometimes it shows a bit of the bacony, hickory smoke and on other occasions it shows dark fruit notes and a bit of spice. I think you'll find this variation dependant upon what wine or wines precede it...Anyway, for less than the price of a good St. Joseph or Crozes-Hermitage (never mind some of the silly priced California Syrahs! ), you're drinking well here. The Wine Spectator has often affixed a score in the high 80s to Villa Pillo's "Borgoforte." It routinely fares well in tastings, but in 2008 the stars and planets aligned and someone 'tagged' the wine with a 92 point score. We think these scores are misleading and meaningless, so you won't find them posted on our web site. Bob describes the whole endeavor of rating wines using the 100 system as "a stupid rating system for stupid people to buy stupid wines." Well, if you don't have a wine merchant who can guide you to a good bottle of wine, perhaps relying on some sort of rating system might make a bit of sense. Competing wineries took offense, however, at Villa Pillo's success. How can a $12 bottle merit a 92 point score, when so many wines hoping to sell for $50-100 (or more) can muster, say, 90 or 91??? So, now the folks at The Wine Spectator have, apparently, seen the error of their ways. The new vintage, though it is virtually identical in quality, intensity, complexity, etc., to the previous vintage, merits a mere 86 points. We can't say if the critics over-estimated the quality of the 2006, but if that vintage was worthy of that lofty score, then so is the current vintage. What it does illustrate, however is the absurdity of rating wines on a precise scale. It also demonstrates that many supposedly impartial critics do not taste "blind," something we've suspected for a long time. And we pity those who slavishly follow these ratings to determine whether or not they enjoy a particular wine. We believe this estate is one of those little "hobby" wineries, owned by someone who's spent his youth and most of his adult life in some other enterprise. The Marinai family, we understand, bought this little azienda in the early 1960s. 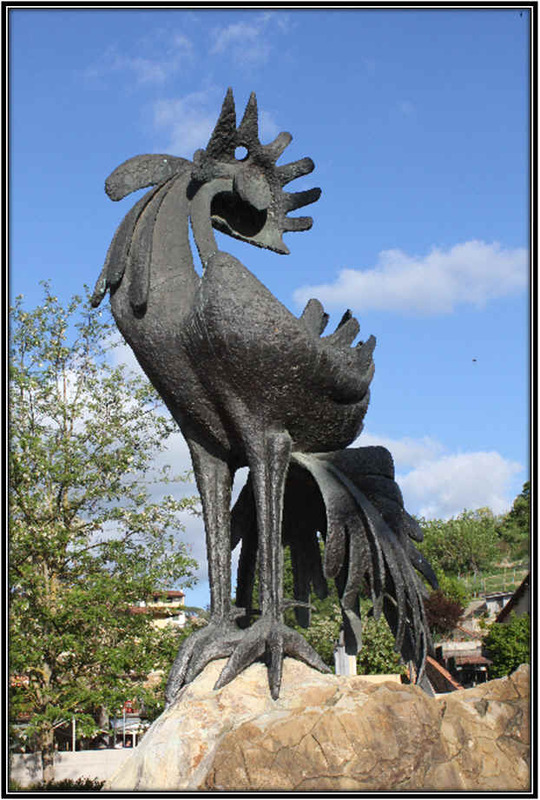 The estate has a long history and was a farm featuring grapes, olives, grain and cattle. The actual name of the property is the "Podere di Cecione." Since the mid-1990s, the estate has been operated by Renzo Marinai, who's implemented a new regimen of organic or biodynamic farming practices. And it's only under his stewardship that the place even bottles its own wines and olive oil. Not only that, they have their wheat milled and turned into pasta by an old pastificio (Fabbri) in nearby Panzano. 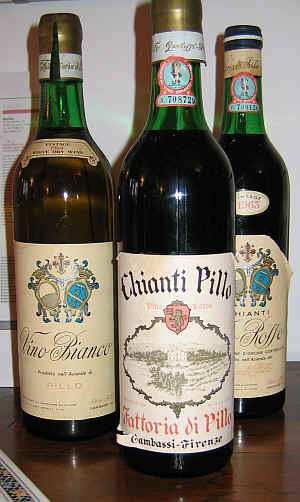 Under his father's ownership, the winery sold fruit to the large Chianti giants. Grapes or wine was purchased by the likes of Brolio or Antinori. Renzo took over in 1996 and I gather it's a retreat for him from his normal digs in Fiesole. Apparently his main work has been in the world of real estate and the world of agriculture and viticulture provides a nice escape. The estate comprises something like 27 hectares. Presently about 5.5 to 6 hectares are devoted to vineyards. They've been farming biodynamically since 1995, or so, according to Marinai. 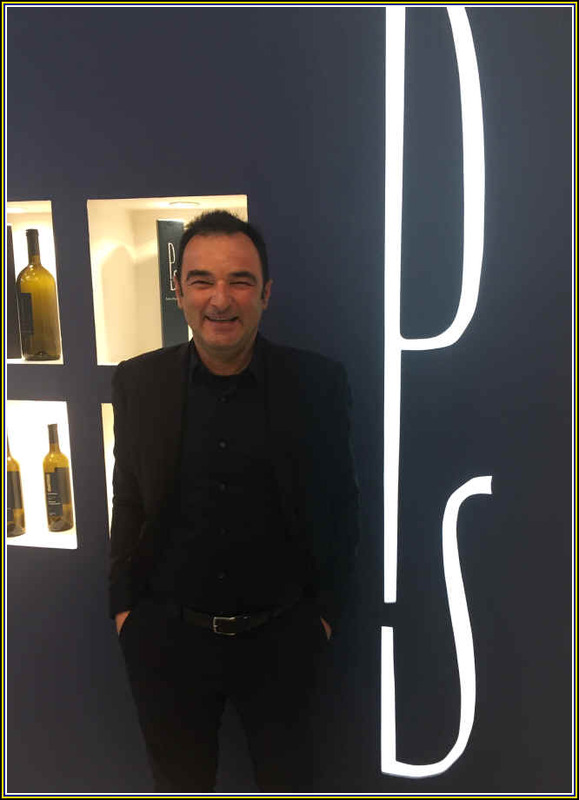 Giovanni Cappelli is the winemaker and he's, as we understand it, involved in a number of other Tuscan wine estates. 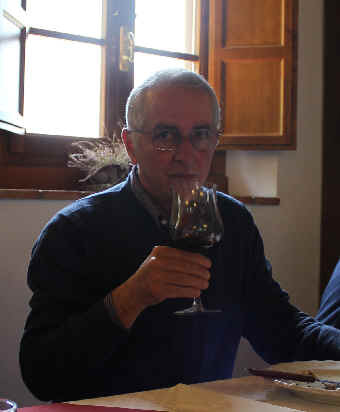 The vineyards are managed by Fabrizio Bal�. I happened to taste a remarkably good "Riserva" from this estate some years ago and made a point of visiting the winery in 2010. At the winery, I tasted a good little dry white...made, it seems, more for their own amusement than for commercial sale. The 2008 Chianti Classico was very good...dark cherry fruit and a faintly spicy element. The actually make a Cabernet Sauvignon named in honor of Marinai's father...While many Cabernets from the area take on Tuscan terroir, I found this wine to be a really nice example of Cabernet Sauvignon. A Vin Santo from the 1999 vintage was a pleasant surprise...more fruit than nutty, oxidized notes! I was invited to join in for lunch with Marinai, his brother and a bunch of their old cronies. A simple pasta with pumpkin and tomatoes. Here she is offering a plate of beautifully stewed chicken. 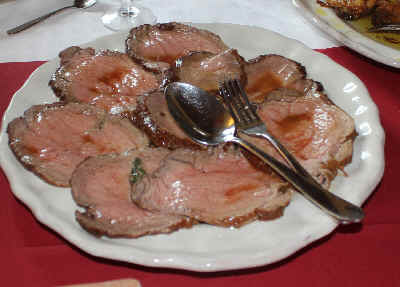 And since the chicken probably isn't sufficient for these guys, how about some roast beef? Today Brunello di Montalcino is a hugely prestigious appellation and its wines carry price tags from "deluxe" to stratospheric. It wasn't always this way, though bottles of Brunello from the Biondi-Santi winery (credited with creating "Brunello") have long been an extravagant purchase. 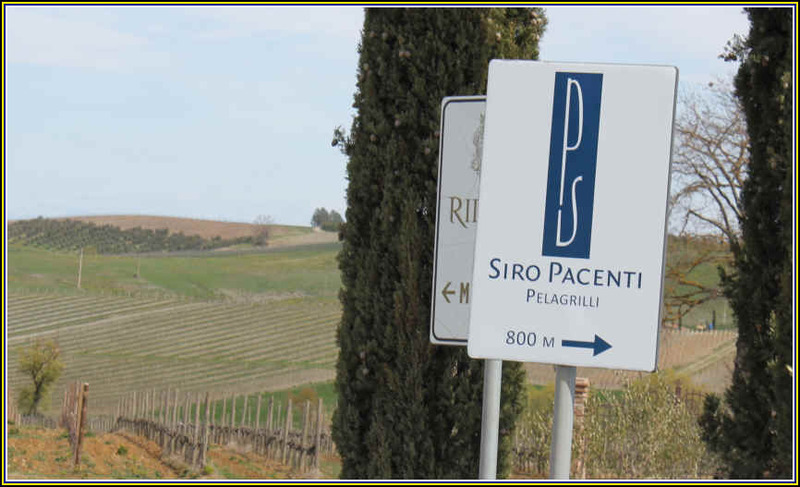 In terms of Italian cellars, Siro Pacenti's is a relatively new property (planted in 1971, or so, and making its first vintage in 1988). There isn't a long history of numerous generations of the Pacenti family growing grapes and making wine. Giancarlo Pacenti, son of Siro, runs the show. They have about 22+ hectares of vineyards in two prime locations. 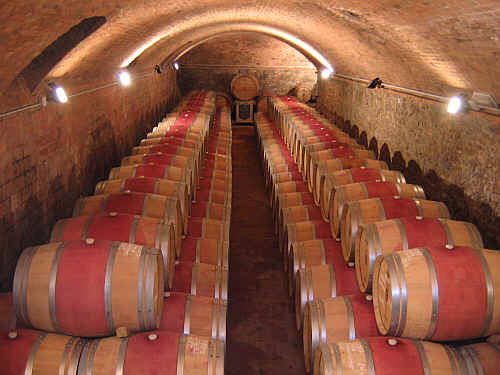 The winery is located in the northern part of the Montalcino appellation and this is also the home of the wine cellar. It's called Pelagrilli and you'll see this name on bottles of their entry-level Brunello. 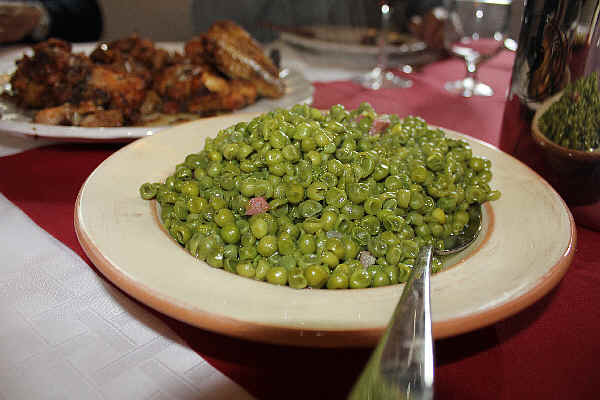 Pacenti now uses fruit from his grandfather's estate which is located in the southwestern area of the appellation in an area called "Piancornello." Giancarlo had gone off to France to study winemaking and his experience in Bordeaux helped shape his cellar protocols. 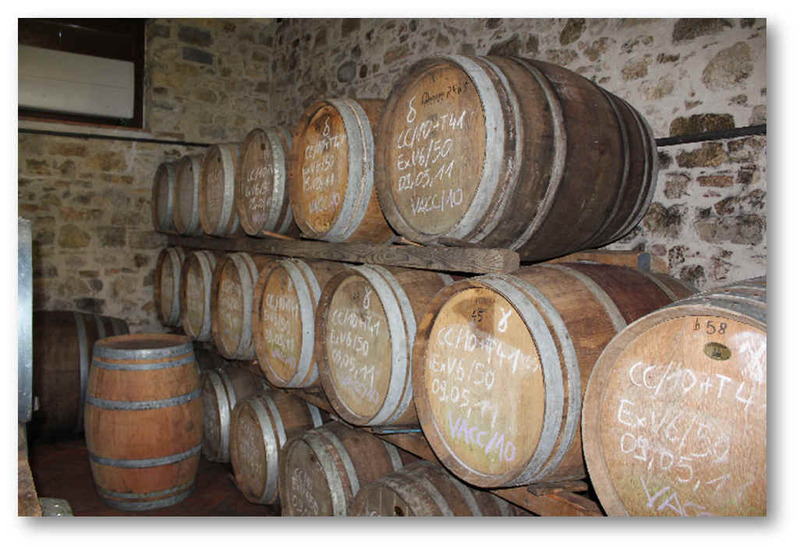 Brunello wines had been required to spend four years in wood, so large botte grande were typically found in every cellar in Montalcino. Over the years the regulations have changed as some winemakers felt the laws were detrimental to wine quality in many vintages. Brunello di Montalcino wines had often been a bit rustic and often with remarkably high levels of acidity which preserved the wines for several lifetimes. 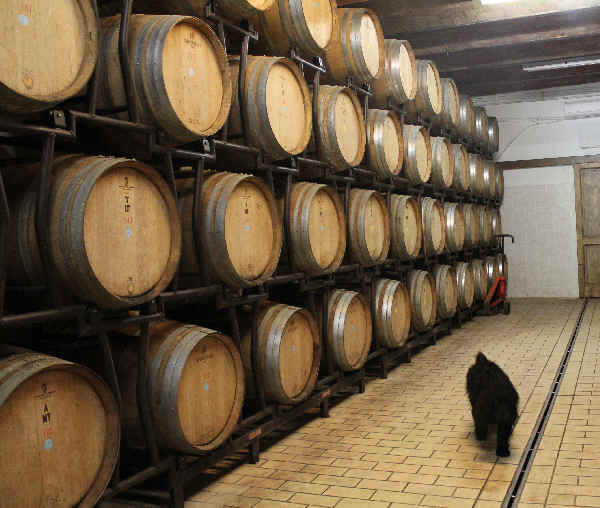 These days the requirement is for a two year minimum on wood and using small barrels instead of large wood tanks can yield wines of radically different style from those made in the mid to late 1900s. Some people find the Pacenti style to be "too modern" and untraditional. Others find the wines to be polished and handsome. When the wines are young, they certainly stand apart from most other Brunello wines. With cellaring, Pacenti's wines age magnificently, though and they are rather showy and harmonious in their youth. 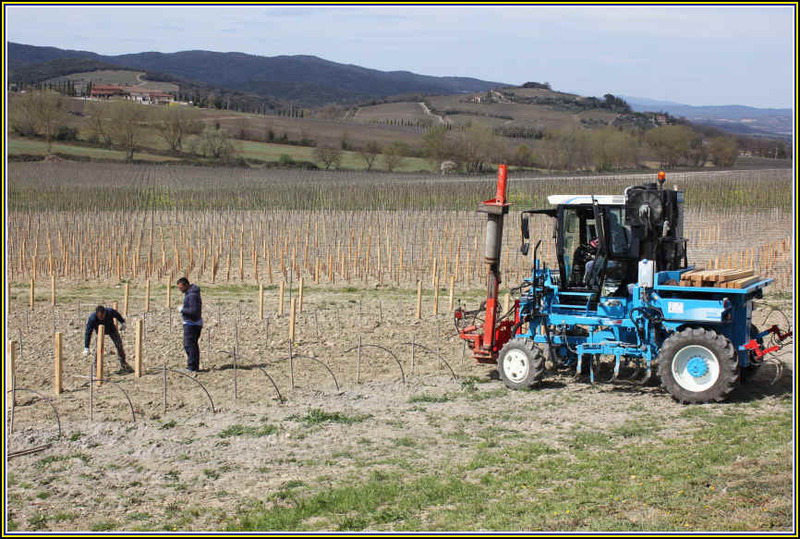 During a visit in 2019 they were planting a site close to the Pellagrilli cellar. The cellar at Pacenti is spotless. 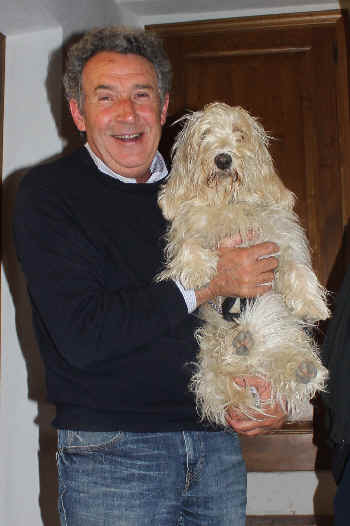 Giancarlo Pacenti (in the early 2000s). The Brunello is matured in 70 to 80% new oak, while Pacenti typically devotes about 20% new cooperage for the Rosso di Montalcino. Giancarlo told us he buys oak from four or five favorite coopers, saying "They work well for us." 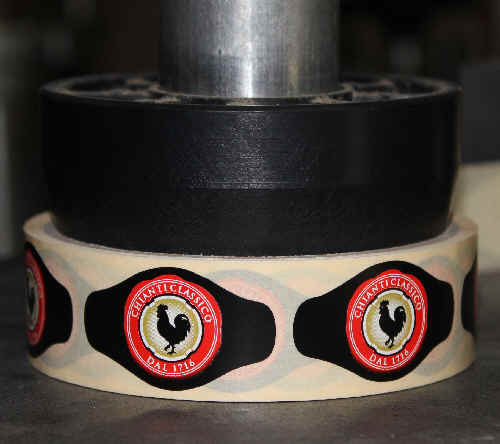 "Our biggest worry is to maintain a high standard of quality." said Giancarlo. 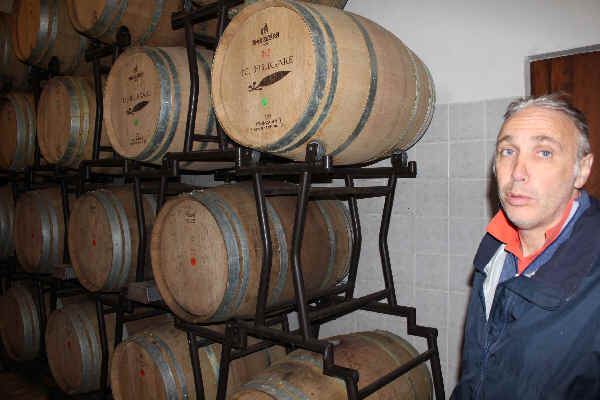 Giancarlo shows off his wine collection, stashed amongst the barrels of Brunello in the winery. We have found the Pacenti wines to be consistently good. Our enologist pal Giampaolo Chiettini was most impressed by this cellar. "They have 22 hectares and produce only 50,000 bottles. That's someone who is very serious about making top quality wines." he said. The 2012 Brunello di Montalcino is a rather elegant rendition and it seems as though the wines, over the years, have become a bit less oaky, though they still employ a high percentage of new barrels. The basic bottling is now called Pelagrilli. The vineyards are about 25 years old. Hand harvested, of course and Pacenti employs a sorting table to further select the best fruit and toss out anything that's not perfect. The wine goes into French oak barriques but they're not all brand new so you'll have to search to find much in the way of wood. This is a very good bottle, but it really needs a bit of time in a wide decanter (maybe 1 or 2 hours) to breathe and open up. We think you can hold this through 2025+. There's the "old vines" bottling, called Vecchie Vigne. These vineyards are 35+ years. I think it's a crime to call people 62+ years of age "seniors" and I see this at the movie theater all the time, so I'm not sure that 35 is really an "old vine." You'll find the Vecchie Vigne bottling to be a somewhat more concentrated and slightly full-bodied Brunello. It's the wine on which Pacenti made his name. The vineyards are in two decidedly different microclimates...this is part of his secret. It's aged in small French oak for about two years, but there's a more marked oakiness to the wine at this stage. With time that ought to integrate with the fruit and become less noticeable. The Rosso di Montalcino has routinely been a feature in our shop. Pacenti makes a beautifully balanced wine that you can enjoy in its youth. The wine features Sangiovese from both the north and south and it's from their younger vineyards. These are approximately 15 years old. The 2016 is a wonderful vintage and we can highly recommend this. Some call it a "baby Brunello." We find it to be a bit more polished and complex than the typical "Rosso di Montalcino." It's more refined and elegant than a "spaghetti red," so pairing it with an upscale burger or red meat will make for a fine combination. This estate has been around since the mid-1970s when it was founded north of Montalcino by Giulio Consonno. His son took over the estate and I recall him telling me he was intent on making Altesino one of the leading Brunello producers. But dad died and the son, it turns out, didn't want to continue, so the property was put up for sale in 2002. In their early years the wines were good, but didn't strike me as particularly special. Somewhere around the late 1980s, things seemed to start improving and into the 1990s there was a more noticeable change. The current owner is Elisabetta Gnudi Angelini whose late husband's family had been in the pharmaceutical business. She bought the famous Caparzo estate (next door) in 1998. 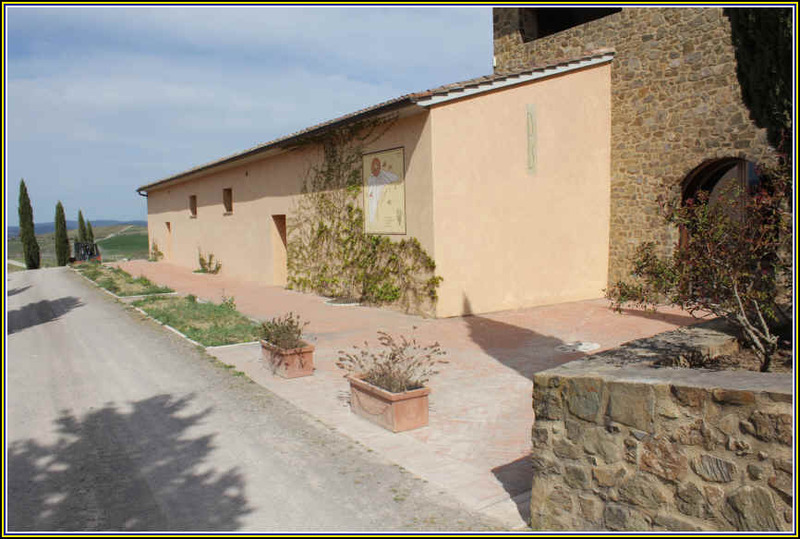 The Angelini family owns the Val di Suga property, another Montalcino estate, amongst other Tuscan holdings. 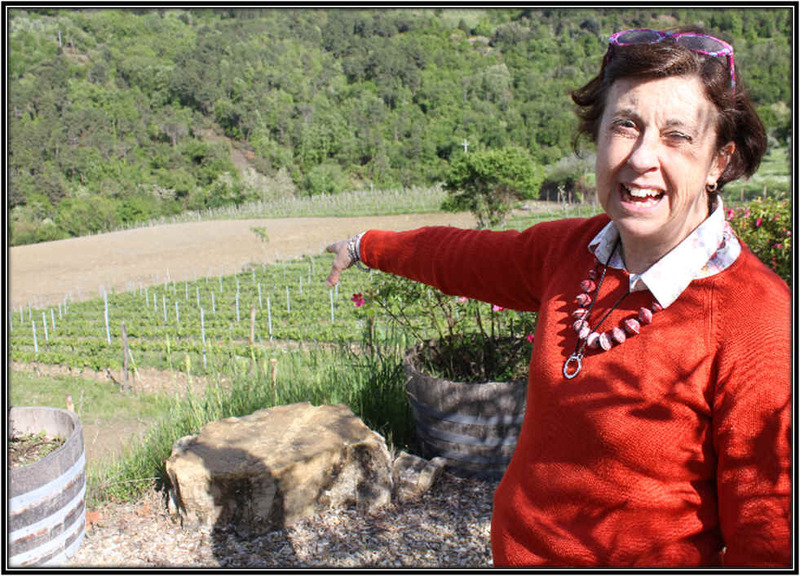 Elisabetta leaves the operations at Altesino to Claudio Basla, who has been the general manager since the 1970s. She does, however, run things at Caparzo. Altesino farms less than half the 140-something acres. About 47 acres are in the appellation qualifying as "Brunello." Three distinct vineyard sites or "crus" comprise this property. One is called Altesino, another is La Velona while the third is their famed "Montosoli," who name appears on their top Brunello in selected vintages. They strive to make traditionally-styled Brunello at Altesino, trying to capture the results of careful cultivation in the vineyards. 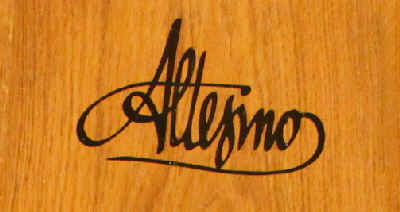 No famous consulting winemakers will be found visiting Altesino, either. In fact, I think Caparzo, at one time, did have a celebrity consultant, but no longer. These enologists tend to leave their fingerprints all over the wines they touch and Ms. Elisabetta seems to prefer to make unique wines which reflect the estates, not the winemaker. Quite a range of wines is made here. A Rosso di Altesino is their current "entry level" wine, a berryish red that's 80% Sangiovese with 20% Cabernet Sauvignon and Merlot...and yet the Sangiovese is highlighted, for the most part. There's a Rosso di Montalcino which spends about 8 months in Slavonian oak...perfectly standard quality, well-made and correct, but not especially exciting. The red called Palazzo Altesi is a wine made entirely of Sangiovese. I was told this is intended to be some sort of "homage" to the French, as there's some whole-berry fermentation here as well as maturation in small French oak barrels. I wouldn't mistake it for a French wine, however...I find some resiny notes with a hint of eucalyptus. The basic Brunello di Montalcino from 2011 basic Brunello is a very nice bottle. You can easily drink it tonight and we've found the wine does well with an hour in the decanter. It's a medium-bodied Brunello...the tannin level is modest, so it's showing nicely now and ought to do well through 2020-2025+. 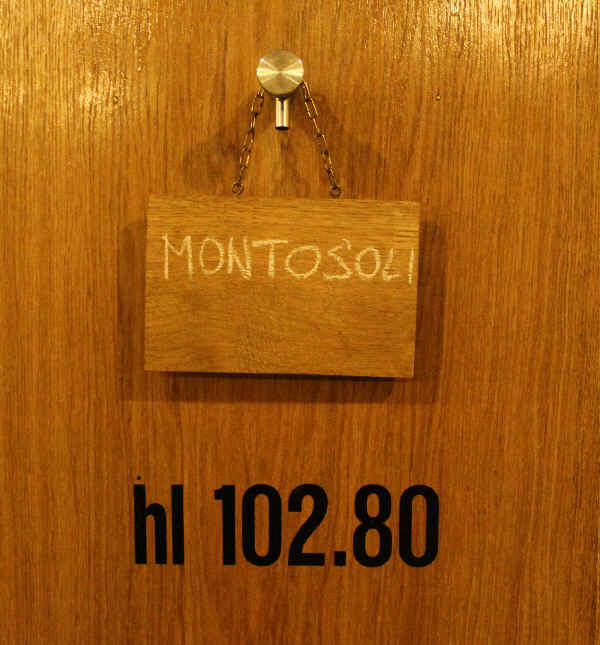 Then, the star of the cellar, is the single vineyard Brunello called Montosoli. The 2004 was very fine and more complex than the others...the tannins seem a bit rounder and the overall impression is of a fine, elegant, classic Brunello. It is drinkable now, but holding it for 10+ years is probably ideal. This 40 hectare property was purchased by Piemontese wine mogul Angelo Gaja. It had been owned by a fellow from Brescia and Gaja came along as a shareholder in 1994, with Gaja owning the whole place, lock, stock and barrels by 1997. One change instituted by the new regime was the removal of all the Malvasia and Trebbiano vines. There would be no watering down the red wines and no Vin Santo produced here. Nor does this winery produce "Rosso di Montalcino." At one point they did make an "IGT" wine here called "Promis," but now that wine is produced at Gaja's other Tuscan property. "Promis," in case you're wondering, is about 90% Sangiovese and 10% Cabernet. 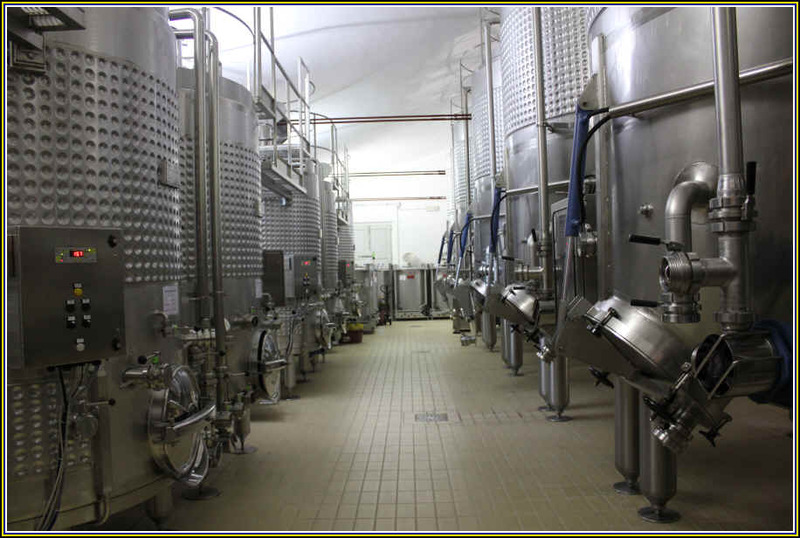 Two bottlings of single vineyard Brunello di Montalcino are made here. One is called Rennina, a wine from sandier soils. It comes from three different vineyard plots. The Sugarille bottling comes from one site and the soils feature more rock and clay. In a blind-tasting we conducted of famous and highly rated Brunello di Montalcino wines from the 1997 vintage, the Gaja Sugarille bottling won by a wide margin. While visiting the estate, we tasted a few vintages and I am delighted to report there is quite a good "learning curve" in evidence here. The older vintages are okay, but it's the 1997 and 1998 that over-shadowed the highly-rated 1995 vintage and the pretty fair 1996 vintage. The single vineyard wines have escalated dramatically in price to Gaja-esque levels of grandiosity. These should sell for $100 to $125. We've seen some 10 to 12 year old vintages of the single vineyards and these retail for $275 to $350. It's nice to be able to buy well-cellared wines, but we can't say the wines justify their prices. The entry-level Brunello is a recent addition to the roster and this wine has been somewhat sensibly-priced and it's good quality. We have the 2011 in stock presently...medium-bodied, mildly woodsy and very good Sangiovese. 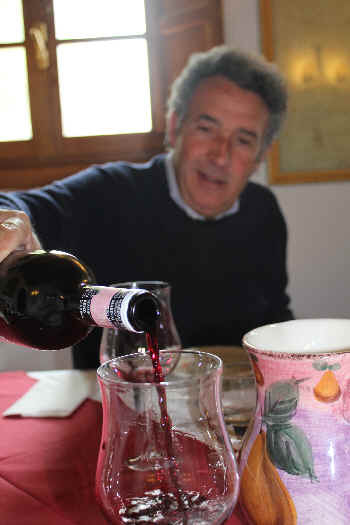 One of the top names of Montepulciano, Federico Carletti bottles some terrific wines under the Poliziano flag. 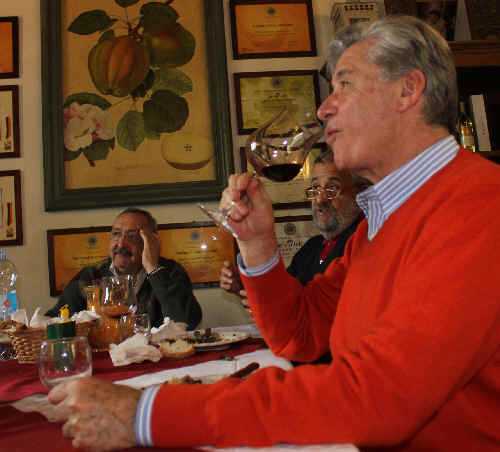 He's been an outspoken advocate of changing the rules of Vino Nobile to improve the wines. A stickler for quality, his attention to detail in the vineyard and cellar shows up in the bottle. Carletti makes a couple of vineyard-designated Vino Nobile wines and we have a lovely, sturdy wine with the "Vigna Asinone" designation. This has been called a "premier grand cru" of Montepulciano by one Italian wine guide. The wines are quite good these days. At one point in time, they were a bit less "Tuscan" and more internationally-styled. Carletti now admits this, saying "In the 1990s we made international wines. Since 2000, we're back on track making Montepulciano." The "simple" or "regular" bottling of 2012 Vino Nobile is neither simple, nor regular. This is a modern wine which retains its nod towards tradition and typicity. I think Carletti has been a fan of Colorino and Canaiolo as blending varieties with the Prugnolo Gentile (that's a Montepulciano name for Sangiovese). Even if you're not familiar with traditional Tuscan red wines, you will most likely find this to be a wine with plenty of "class." It is a vino which is truly nobile. 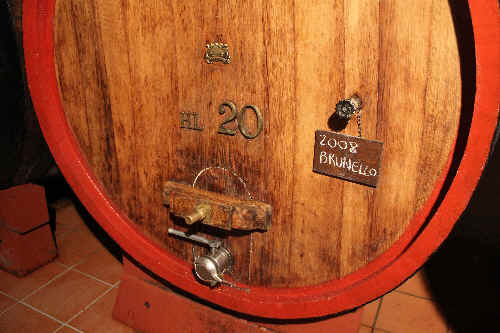 The 2012 Vino Nobile is, we are told, 85% Sangiovese and spent 14-16 months in wood, less than many previous vintages.. 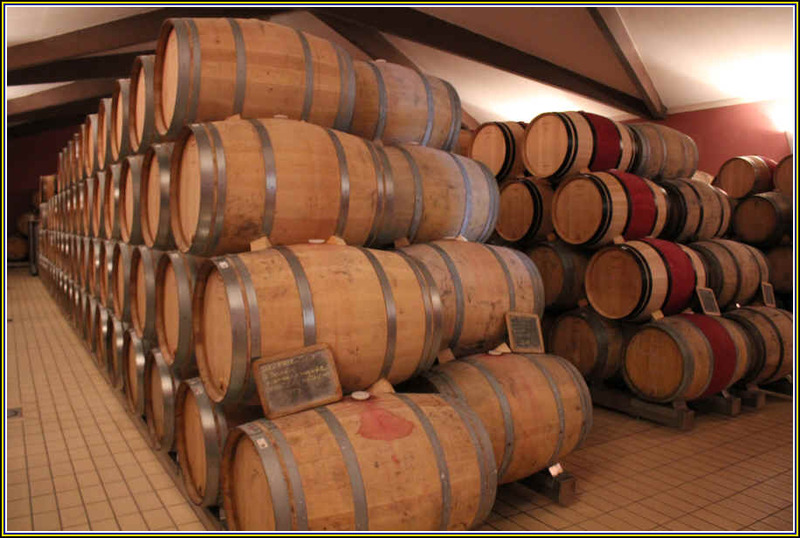 Two-thirds of the wine was matured in barriques and puncheons, while the rest sees large, very neutral wood tanks. The trend at Poliziano has been to use less wood, but we still find a nicely cedary, woodsy tone at this early stage. Mildly tannic, this doesn't require much cellaring as it's delicious now, especially with food. Large "botte" to ensure the wines don't taste over-wooded. Poliziano is using some American oak, too! In the 1960s, a Florentine jeweler bought this property, situated in San Donato in Poggio (just north of Isole e Olena and south of Badia di Passignano. 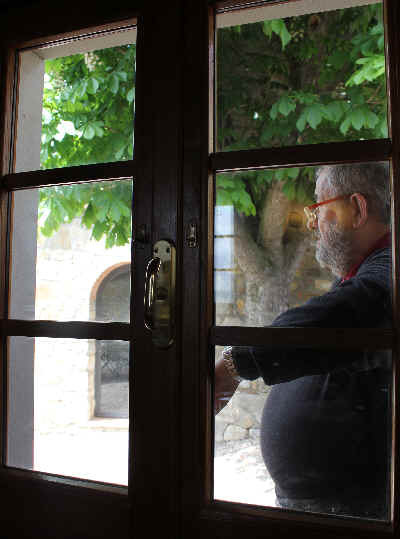 As he set about restoring this fixer-upper, he took ill during a period of inclement weather and Carlo Cassetti Burchi found himself in the hospital. He'll tell you not to have pity, for it ended up being a fortuitous situation...the patient in the next bed was an old fellow who mentioned to Carlo that his son was a winemaker. And when the son came to visit, he promised Carlo he'd some to the estate and have a look to see if it was worth planting vineyards. It turns out the son was none other than Giacomo Tachis, a Piemontese fellow who worked for a little winery called Antinori (where he helped make the first "Super Tuscan" wines, Antinori's Tignanello and Antinori's cousin's Sassicaia). Tachis paid the Le Filigare estate a visit and, as we understand it, made some viticultural suggestions. The property is mostly devoted to Sangiovese (we're told it's the Brunello clone), with Canaiolo, Colorino and tiny amounts of Cabernet, Syrah and Merlot. The estate comprises something like 60 hectares. There's a ten hectare planting of well-manicured vineyards, but they have another parcel that's mixed plantings of olive trees and vineyards. We've tasted several vintages of Chianti Classico from this estate and have found them to be really "fine" expressions of Sangiovese. I think the 2013 is perhaps the seventh or eighth vintage we've had from this estate. The 2013 vintage is currently in stock. They'll tell you it's about 90% Sangiovese with equal parts of Colorino and Canaiolo. 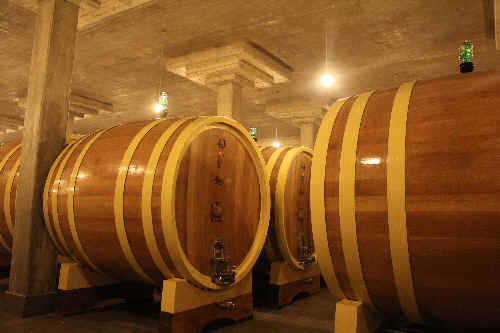 The wine spend a few months in both large wooden tanks and small barrels. We like that it's not an oaky, woody wine, but features the fruit on the nose and palate. This is certainly drinkable now and we suspect it will age well for another 5-10 years. The Le Filigare estate, by the way, has more than a handful of apartments for rent...their website has info on these. Alessandro Cassetti-Burchi in the cellar at Le Filigare. 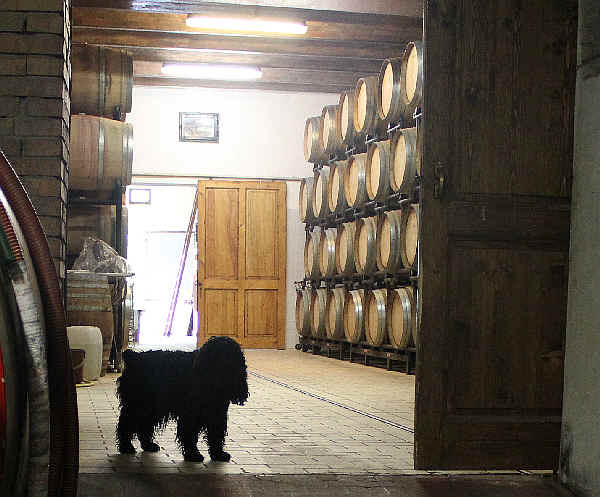 One of the winery dogs checking out the barrique cellar. Tasting the impressive line-up at Le Filigare. 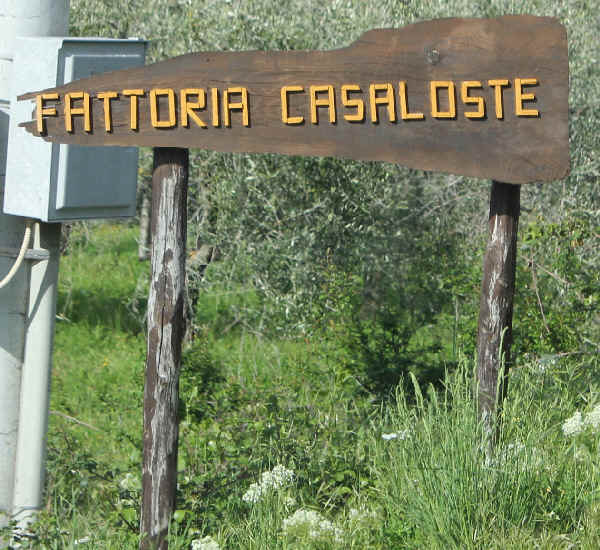 While many Italian winemaking families have histories going back hundreds of years, the Casaloste estate's story goes back only into the 20th Century...and not very far, at that. 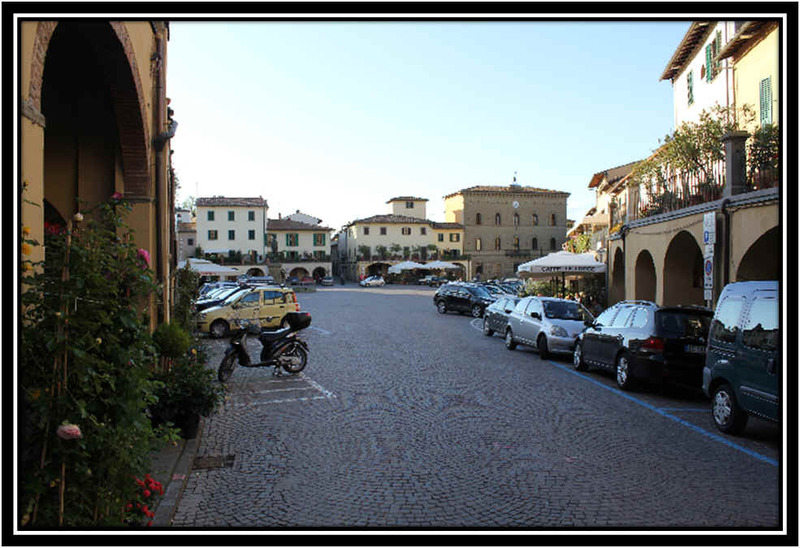 The property is situated in Panzano in Chianti and within this vaunted locale, there's a site known as the Conca d'Oro. One Italian wine guide terms this a little corner of Paradise. Fontodi is a famous estate in the Conca d'Oro, along with La Massa, Rampolla, Villa Cafaggio and several others. If the Conca d'Oro is a grand cru site, then the wine of Casaloste and some of its neighbors (Panzanello, Le Cinciole, Le Fonti and a couple of others) comes from what we might consider a Premier Cru exposure. This estate is, then, from the Conca d'Argento! This little zone is a bit cooler than the Conca d'Oro, so with climate change, they may be in just the right place at the right time. Casaloste has been on our list of estates to watch for perhaps a decade now. The estate used to be part of the vast Montagliari property and the owner sold off a little piece in the early 1990s. It's owned by Giovanni Battista d'Orsi, an agronomist from Napoli, and he employs organic farming practices as he's long thought this was "the right thing to do." These days, many wineries make a big fuss over organic farming, but more for marketing than for actual agriculture. In fact, virtually all the vintners and growers in Panzano are considering an initiative whereby they will all farm organically...stay tuned on that! The consulting winemaker is Gabriella Tani and we've been a fan of some of her wines for quite a while. Unlike some of the most famous celebrity winemaking consultants, her wines seem to retain the character of where they come from. 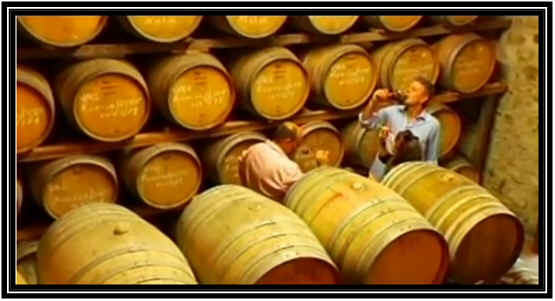 The Casaloste estate comprises about 10.5 hectares of vineyards, though the property covers perhaps 19 hectares in total. The 2012 vintage is showing handsomely and we were surprised to learn they often blend Merlot into the wine. They have a nice little trick in making this, however...the Merlot is picked earlier than the Sangiovese and it starts its fermentation. 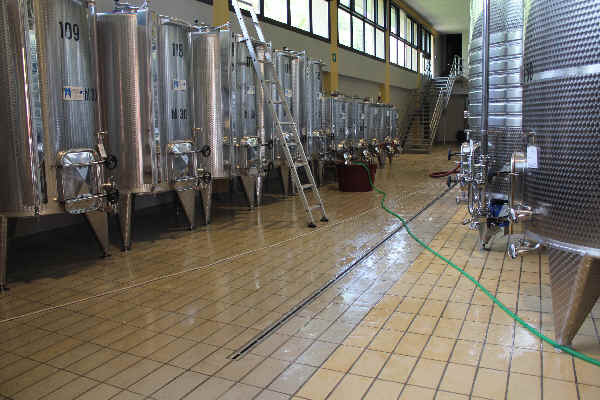 During its fermentation, the Sangiovese is harvested and added to the fermentation tank and as there's an active yeast population, it begins to ferment immediately. This seems to suppress the character of the Merlot, or, at least, it allows the Sangiovese to shine. Given the mildly tannic bite of this wine, pairing it with something such as lamb or beef will confer a softer quality to this Chianti. Giuseppe Castiglioni came from Milan to Tuscany via a rather circuitous route...Mexico was in the middle, somehow, as he was in the steel business. 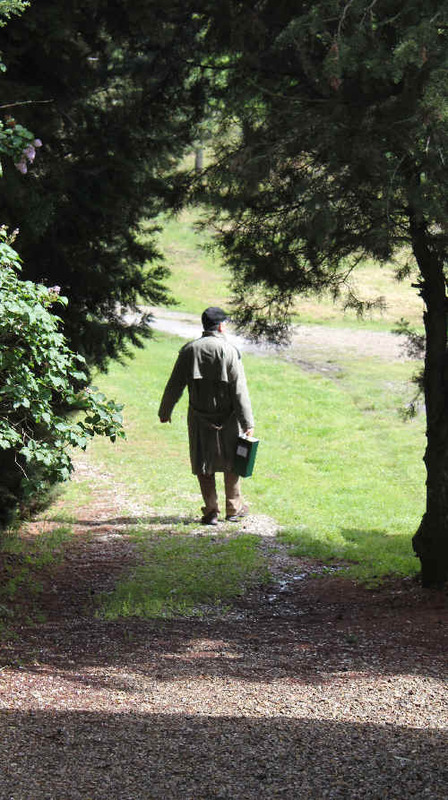 He invested some of his earnings in a little piece of property just outside Greve in Chianti. Of course, one has to plant a few vines if no vines are planted. So he did and he made a little wine. Not bad, either. So he planted a few more vines. One thing led to another and soon it appeared that this vineyard site might really be "something." The winemaker is Guido de Santi and he's had counsel and advice from the famed winemaker, Giacomo Tachis who used to work for Antinori where he helped create wines such as Solaia and Tignanello. 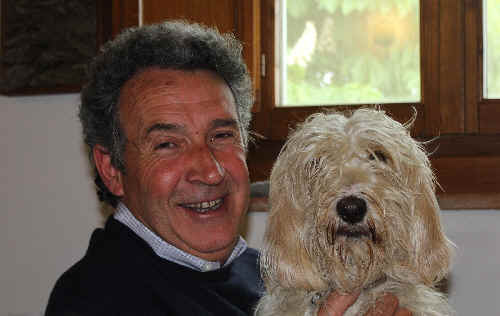 De Santi had also worked at Isole e Olena before moving to Querciabella. 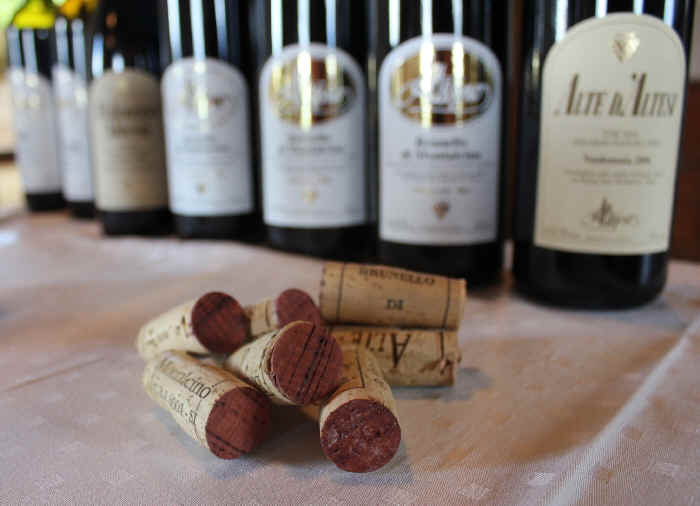 The wines of Querciabella are very well known in the European connoisseur market, but they had been rather a mystery to many American wine drinkers. The U.S. importer did not do a lot to bring this estate to the attention of wine drinkers, as you had to know the secret handshake to even be able to buy wines from that particular firm. A couple of summers ago we bought numerous bottles of Chianti wines while there on a research mission. One of the very best Chianti Classico wines we scoped out was Querciabella's. There's lots of dark fruit notes to this wine, partly because they have blended in a tiny amount of Merlot, Cabernet Sauvignon and Syrah with their Sangiovese "base" wine. 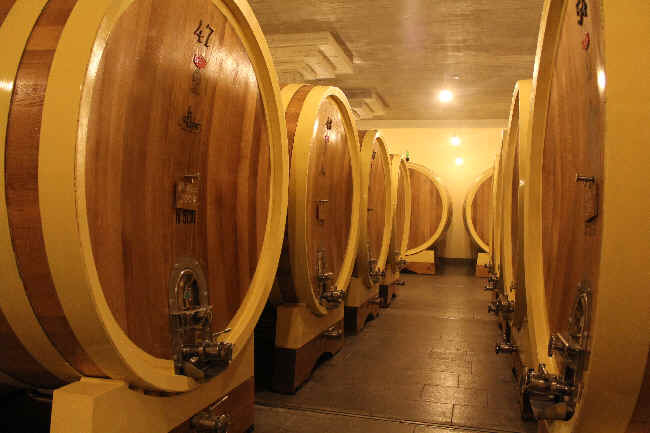 The Sangiovese is matured in French oak, about 30% of the wood being new. The "international" varieties are vinified separately and each is matured in about 80% new wood. 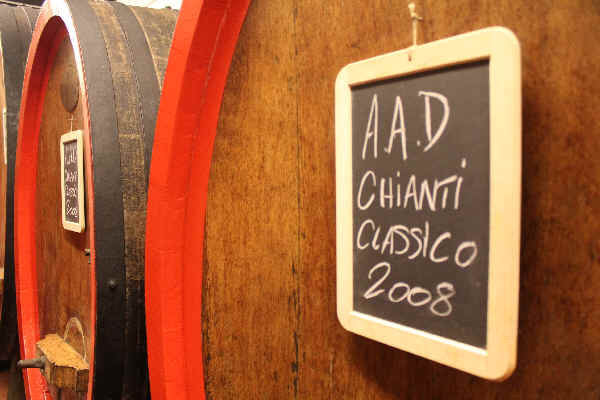 The best barrels are selected and the Chianti Classico is then blended. They're typically 95% Sangiovese and with 5% Cabernet Sauvignon. The wine is more refined and elegant than "simple" Chianti, but less oaky and less "internationally-styled" than most so-called Super-Tuscans. I often find a rather floral tone to the fragrance of Querciabella Chianti. It's a good deal more exotic in terms of aromatics than most other Chianti wines. The winery does not produce a "Riserva" Chianti, as says winery rep Paola Bianchi, "Our intention is to produce a 'super-Chianti Classico.' There is never enough real Chianti Classico." It's also more graceful and elegant. A white wine is called "Bat�r" as is "Batard-Montrachet." At the start, Bat�r was Pinot Blanc and Pinot Gris. Today it's 50% Chardonnay and 50% Pinot Blanc. Barrel fermented. A fair bit of new wood. Full malolactic. It has been one of the great white wines of Italy...but our last taste of Bat�r, from the 2013 vintage, was "good," but not striking or compelling. The Pinot Bianco was planted in 1982 and it was cultivated merely to make a bit of white wine for the estate's owner. 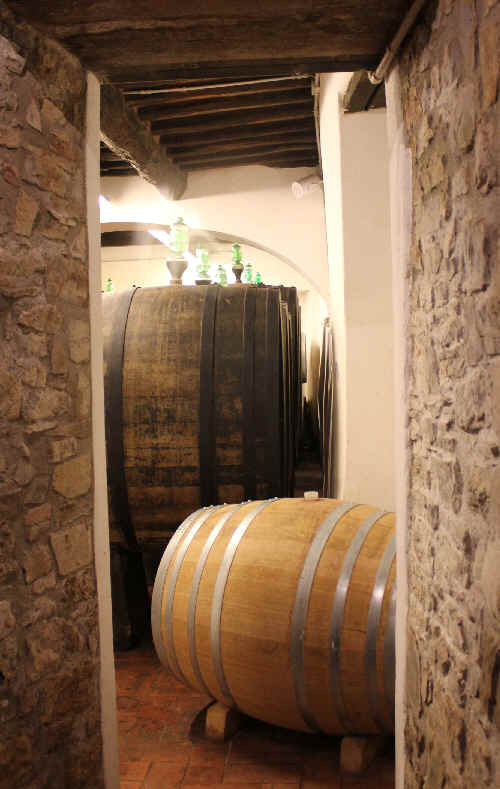 Guido De Santi had the idea of experimenting with a barrel-fermented white wine. A winemaker friend told us he had tasted the Pinot Bianco on its own...phenomenal! The cooperage is set on these new racks which have rollers holding each barrel in place. This allows them to very easily rotate the barrels once the fermentations have finished, allowing for a simple "battonage." This puts the spent yeast sediment back into the wine and contributes a toasty quality. The wine shows a lot of wood when it's young and first released. Given some time in the bottle, the wood integrates into the wine and you wouldn't recognize it from its youth! Two to five years is about right. Guido shows how easy it is to stir the spent yeast with the new barrel racks. One of the impressive "galleries" of barrel cellars at Querciabella. Camartina is Querciabella's "Super-Tuscan." It is super and it's priced like super. The wine is about 70% Sangiovese with about 30% Cabernet Sauvignon and a drop of Merlot and a drop of Syrah. Lots of French oak. The estate does not always produce this wine. They've skipped a few vintages when they felt like they did not have the quality of wine to justify asking their lofty price. (We wish many other wineries, in Italy and elsewhere, would take note of this system and consider having higher standards, too!) Here's a wine of grace, elegance, finesse and underlying power. Perfect for Bistecca Fiorentina! 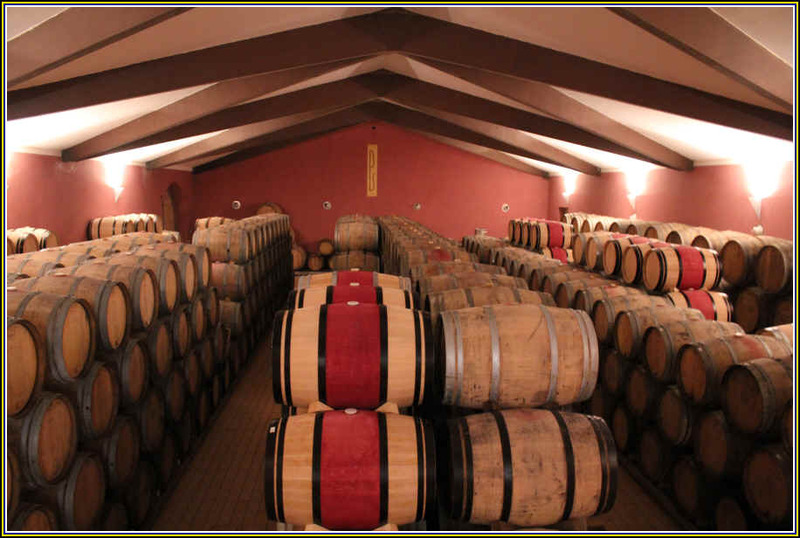 The winery at Fontodi resembles more a Bordeaux cellar in its appearance, with small oak barrels all over the place. Owned by Giovanni Manetti, the estate is located in Panzano in Chianti. The regular Chianti here is usually quite good, while the Riserva wines, a simple Riserva and the "Vigna del Sorbo," rise to even greater heights. They're also cultivating Syrah, Pinot Nero and Pinot Bianco. 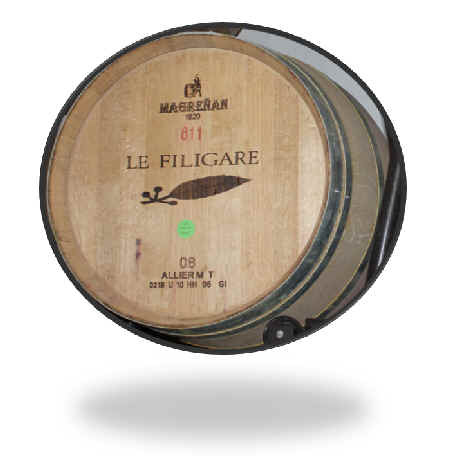 A Super-Tuscan called "Flaccianello" is made entirely of Sangiovese matured in French oak. It is usually a remarkable wine. We have not been buying recent vintages of Fontodi. The American importer asks a ridiculously high price for these wines and we prefer to show customers wines which provide some measure of good value. If you are in Italy, by all means, buy a bottle of Fontodi when dining out. It costs about 14 Euros in an honest wine shop and about 24 Euros in a restaurant. A friend's restaurant in Tuscany has it for 24 on the wine list, meaning he paid about 8 Euros. The US importer pays less due to the quantity they buy and they avoid the VAT tax levied on goods sold for use in Europe. Meanwhile this import company asks nearly $25 wholesale! Please! We are perplexed as to why Signor Manetti tolerates this situation. If you survey top shops around the U.S. market, you will find current vintages of Fontodi Chianti to be "missing." Too bad for Fontodi, but having a license to import is not a license to "steal." A bit of local "art" displayed near the parking lot a few blocks from the main shopping area of Greve in Chianti.